I just love my new Palette Hybrid ink pads by Stewart Superior. They are so versatile and easy to use! I currently own just the Black and the Canvas ( a soft white) but that Burnt Umber is on its way! I think I’ll be trying out those little colored cubes soon too! The Palette Hybrid inks are the brainchild of Stewart Superior and are a fabulous formula of the best of many types of inks…thus the hybrid name. The black I’ve been using for the past couple years is great, but the with the design of the container, the felt actually sags in the middle making it SO difficult to evenly ink up a large, detailed stamp. 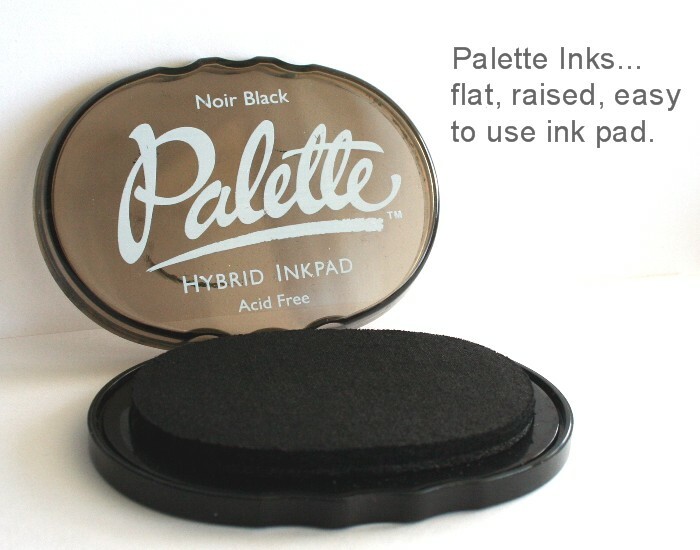 I love the flat, raised surface of my new Palette Noir pad…it always works perfectly. Another great thing is the great, clean impression you get with it and it doesn’t bleed when you want to watercolor the image. The Canvas is a great soft white and my new favorite white. Believe me when I tell you have had a hit and miss time with whites. I love this one! You can EVEN use it on glass, wood, plastic and metal! You just need to heat-set it! If paired up with a watermark or embossing ink, you can still emboss with them. very reasonable price for the flexibility you are getting!!!! I bought my ink pads from two different places. One on-line and another in person. Check them out below! If you have questions about this product, I’ll do my best to answer them by editing in at the bottom of this entry. Have a fabulous day! I used my new Palette inks on this design…Black & Canvas. I love how they instantly dried and gave a crisp impression. For this design I also used some Apricot Appeal dye ink by Stampin Up and a Rose Red Stampin Up marker. I love this Papertrey Ink Text Boxed stamp set. For the main image, I inked it up with my Apricot ink pad and then went over the image detail with my Rose Red marker and then inked around the edges before stamping it onto some watercolor paper. I love the soft look and for large clear stamp, watercolor paper works really well to get an image. After stamping my image, I distressed the edges with my edge distresser to play up on that texture of the watercolor paper. I also stamped out a little flower image, circle punched it and then matted it. Into the center, I inserted a little brad for definition. For the rest of my design, I used a 5.25″ Rose Red square card base and layered it with the Apricot Appeal. After stamping the little dots from the set on another layer of Rose Red cardstock, I adhered it to my card front and then stitched around the outside of my design. Zanne asked : Looking at color, it is a faded shade, as if pad needed ink. Could pad have dried out? Are there reinkers? That’s too bad! Mine is great! It sounds to me like it needs to be reinked. Yes, there are reinkers available. Ellen Hutson sells them. If I were you though, I’d take it back to where you bought it and inquire. You could also e-mail the company and ask them. There is a link to their site at the top of this post. If you do….please let me know what they say. I’d love to know about it and their customer service. Twinks said: Did you reink yours to start as well? Love the Stazon Opague Wite but that came with the reinker and a dry pad so i’m curious about who often one would have to reink the pads. i’m getting nice clean lines but thin lines. Do you suggest reinking? This entry was posted in C'est Bon, Card Designs. Bookmark the permalink. Great review and wonderful card, Julia! Too funny, because I tried the exact same thing with the leaf image in Text Boxed but I didn’t like my color selections and the results ended up in the circular file! These colors are so pretty! Beautiful card! 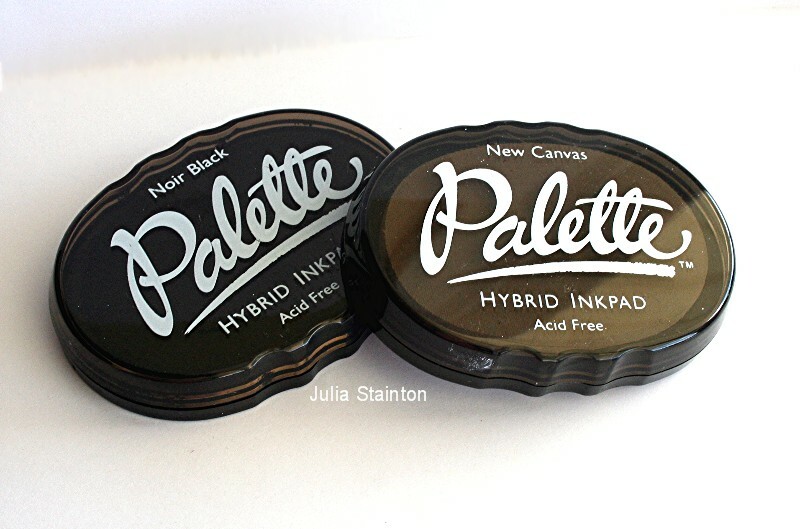 I’ve heard lots about the Palette Noir ink so I’m adding it to my list. Thanks for the great review! Love this card, the color combination is great. Great card, Julia! I’m hoping to see it again, soon! 😉 I like these inks a lot too! Nichole also sells them at PaperTrey ink! It’s great for people that need to bump up their orders a little to get free shipping in the US! I’m so glad you featured those inks! I have been seeing them all over the internet, but had not seen a review of their performance and how the compared to other waterprook inks. Thank you so much Julia! 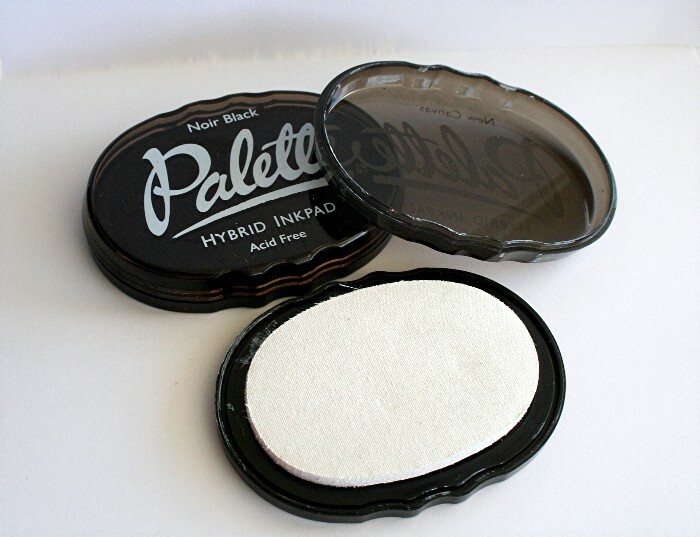 I have just purchased a Noir palette pad to try, and was disappointed in it. The shape of the pad is great, and so is the texture of the pad. I also liked the lid. But, when I inked and stamped, I got a not-black color. Thinking I had mis-inked, I repeated. Same result. I tried red rubber, black rubber, and clear. Still not black. The pad was new when purchased and I cut off the plastic myself. Stamped same stamp with versafine and staz-on – both nice and black. Place new pad upside down overnight, re-stamped, same(not black)color. Looking at color, it is a faded shade, as if pad needed ink. Could pad have dried out? Are there reinkers? I agree….just recently purchased the Noir Black pad and LOVE it. I thought it would stain my rubber like all of the other permanent black pads do, so I was pleasantly surprised whem it washed right off! And it really gives a great image! I’ll have to try the white one now too!! Hi Julie: Thanks for the write up on your pads. I’ll definitately purchase one on my next trip to Stamp Art (I live in Sarnia). Isn’t that store the best!? My b.d. is coming up and DH asked what I wanted and, of course, I said a gift c. to Stamp Art. Maybe I’ll bump into you some time–LOL. I might need your autograph — being “famous” and all — LOL. Love your cards. You are very talented. This is so cute Julia! I love the color combo on this. It’s yummy enough to eat! Another stunning card! Love that little ribbon…nice touch! thanx for commenting on my blog! means SO much to hear from you. 🙂 i’ve subscribed to your blog for a long time so hopefully your blogability (is that a word) will rub off on me a little. hehehe..
I’m like Zanne; I had a dried up Canvas pad and order the reinker. No problem with the black tho. Both sealed and purchased on-line from different vendors. Did you reink yours to start as well? Love the Stazon Opague Wite but that came with the reinker and a dry pad so i’m curious about who often one would have to reink the pads. i’m getting nice clean lines but thin lines. Do you suggest reinking? Your creations are always so beutiful! Thanks for the ink review – I’ll have to try the “Canvas” – I must have 6 different white pads and not happy with any of them! Thanks for your review of the Palette Hybrid inks. I find your C’est Bon entries very informative! Could you tell me the difference between the Palette Hybrids, the Colorbox Chalk by Queue, the Versamagic, and the Versafine inks? I see many different blogs use different kinds and am wondering the differences between them all. Eeeek! Is this asking too much? I love my acrylic stamps but would like a really good ink for them. I love my SU! pads, but find the classics don’t seem to ink the acrylics up as well, and sometimes the crafts are abit too gummy (I might have to de-ink some of them).